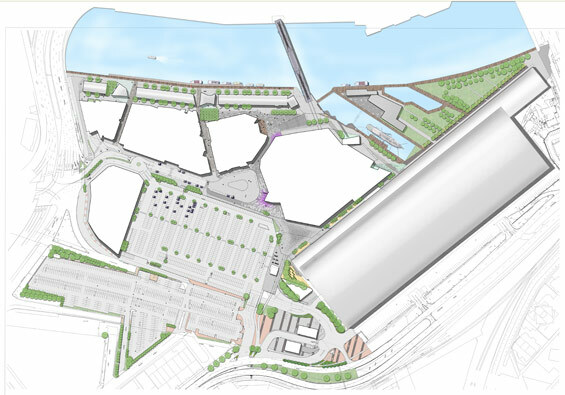 Integration of the public realm with large scale buildings and facilities is the key to ASPECT Studios design for the new Melbourne Convention and Exhibition Centre and the adjacent South Wharf mixed use precinct. ASPECT Studios design allows continuous and seemingly uninterrupted access through the site and amongst the buildings. 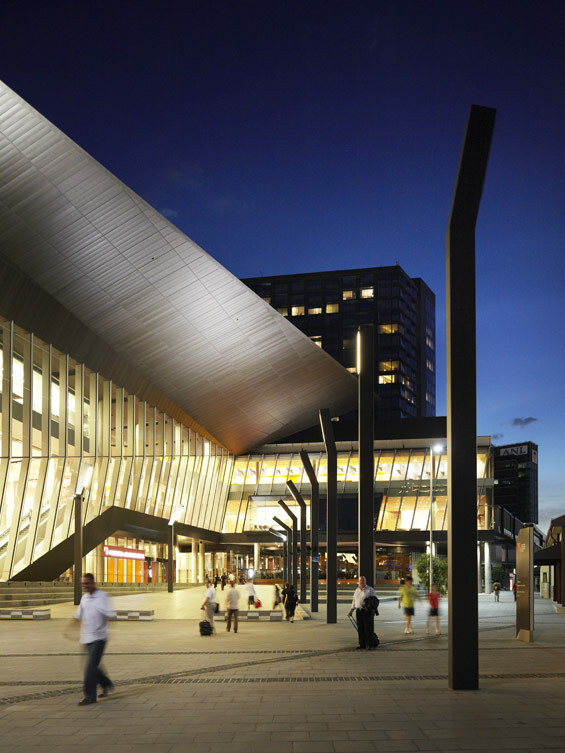 This was no small task for a precinct that contains a convention centre, hotel, retail, residential, public forecourts, promenades, laneways, heritage landscapes and the now refurbished Exhibition Centre Park. 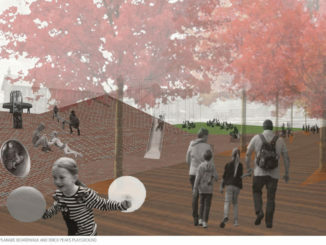 The public realm is the external connective space and tissue of the precinct. It is about ‘places’ and ‘paths’, providing an engaging, directional and textured environment, to complete the missing link in the natural progression along the Yarra River from Southgate through Freshwater Place, Crown Casino and on to the Yarra’s Edge residential precinct. Activity nodes along the circulation routes generate points of interest and ensure an uninterrupted sequence of experiences. 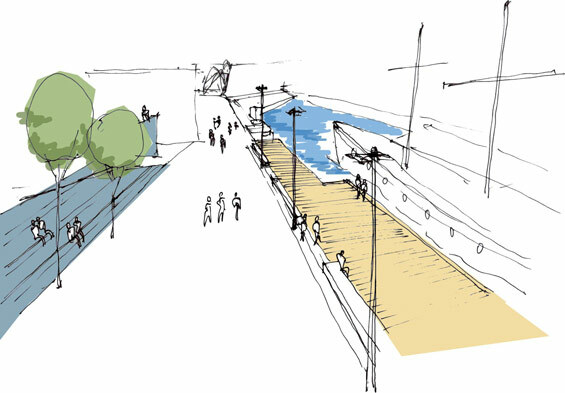 Small streets and lanes intersect the primary flow of the Yarra River promenade generating a rich pedestrian network and allowing view corridors to the river from deep within the site. 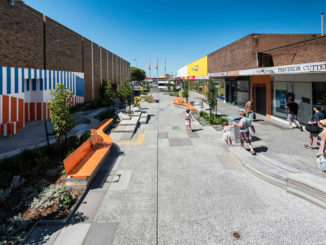 This strategy creates environments that provide comfortable places at a human scale: textured in surfaces and light resulting in places which are distinguishable and diverse, within a cohesive public realm. 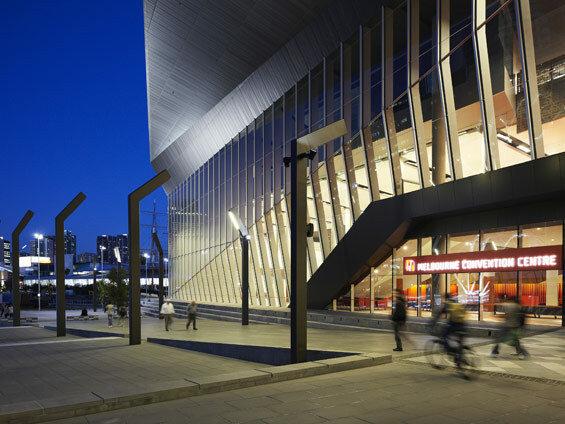 The elements and materials for the Public Realm are informed by the history of the precinct (heritage sheds, working dock, riverside promenade), and the contemporary public realms of the Exhibition Centre, Melbourne City and the Docklands. 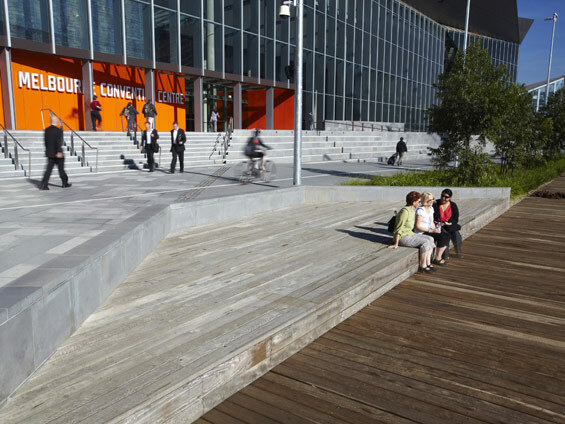 Expansive swathes of surface materials integrate with the City of Melbourne and Docklands public realm palettes. 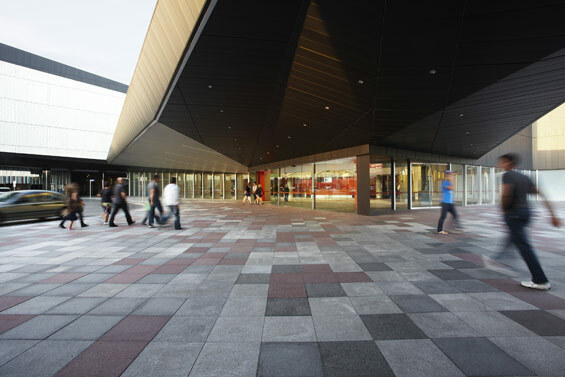 The primary pavement surface is bluestone pavers, with secondary pavements of reconstituted granite pavers and bluestone matching high quality concrete pavers. Other surface materials are used in smaller and peripheral areas such as fine gravel, granite setts, and permeable paving surrounding trees. From former open, post-industrial grassed areas, a predominantly indigenous planting palette transformed pockets of the public realm into vegetated areas of respite.The growing conditions encountered include podium locations, extensive underground services, dry windy environment and strict maintenance regime requirements presented tough criteria that determined the selection of species. A series of raised podium planters irrigated using treated water are filled with low native trees and indigenous coastal shrubs that are both wind and salt-tolerant, and require little irrigation.WSUD garden beds assist with treatment of water run-off from large areas of impermeable public paving as part of an integrated treatment system. 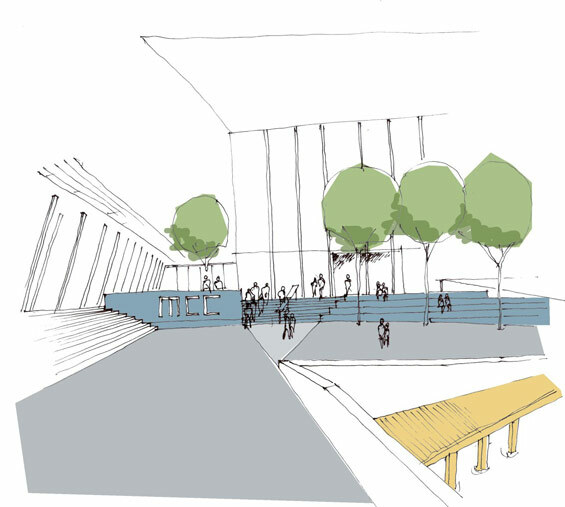 The main feature is a long ‘strip’ garden running parallel to the existing Exhibition Centre. Water run-off from the adjacent South Plaza podium area and carpark is directed through a reed-filled bio retention swale that removes contaminants that would otherwise end up in the Yarra River and Port Phillip Bay. A secondary passive filtration garden bed is located to treat additional water collected from the main building approaches.Tree planting within lower public plaza areas are passively irrigated from both surface run-off and roof driplines to enhance growing conditions, and provide pockets of shade within break-out areas. 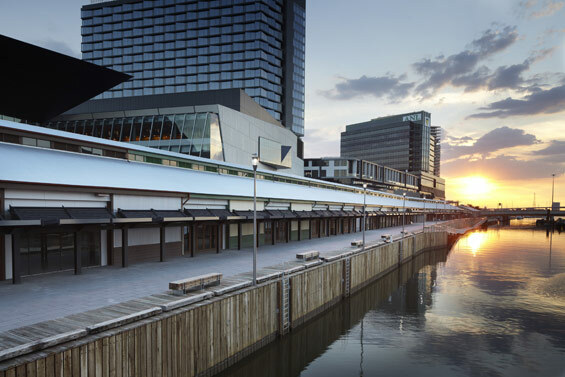 Together, these elements assisted in the overall water treatment that enabled the Convention Centre to attain a 6 star Greenstar rating, the highest sustainability rating achieved in Australia for developments of this type. 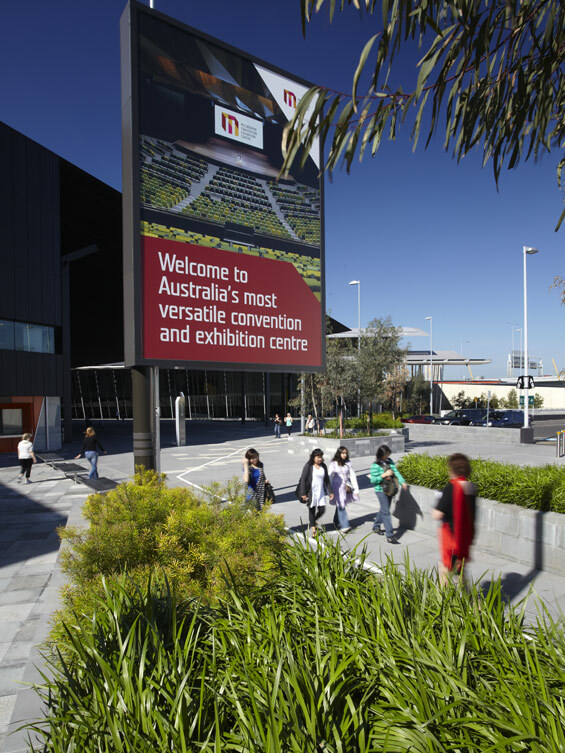 The public realm of the Melbourne Convention Exhibition Centre, exemplifies our approach to collaboration, sustainability and enduring quality. 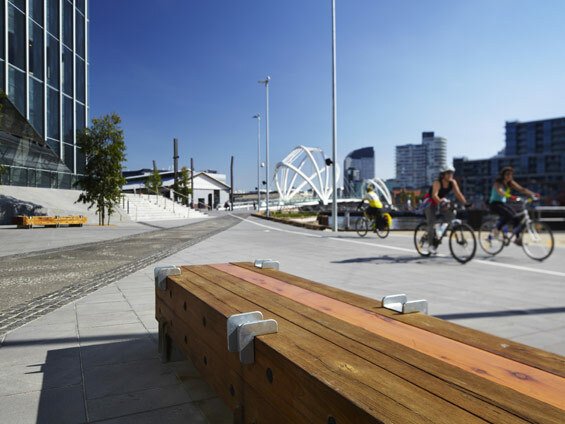 The wharfs, promenades, squares, laneways, rain gardens, porte cochere and integrated cycle ways forms a new significant public place for Melbourne, linking the City to the Docklands and to South Melbourne. Location: Southbank and Docklands, Victoria, Australia. Scope: Urban design, design development, construction documentation, and construction design services.